It is a chance for students to learn a little bit more about the sport of kayaking. The past few weeks students from West Meadow Elementary and Willow Creek Composite High Schools in Claresholm, Stavely Elementary School, Granum School, and A.B. 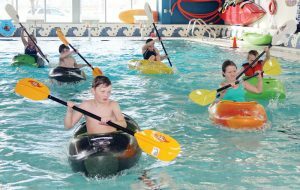 Daley School in Nanton have hit the water at the Claresholm Aquatic Centre where they get hands-on experience and instruction in kayaking. The equipment comes from the Alberta Whitewater Association who provides 18 kayaks, 17 paddles and 14 sprayskirts for four weeks from Dec. 16, 2018 to Jan. 18, 2019 for the aquatic centre to use for the purpose of teaching kayaking in the pool. The program began in Claresholm back in 2016 when the pool received a grant from the Alberta Whitewater Association that included the training of two instructors. One was Ethan Watt, who is entering his third year of teaching kayaking. Denise Spencer, the town’s recreation manager, said Watt is perfect for the role. Students learned how to get into the kayak, paddle, how to get back into the kayak if they have tipped over, and much more.